I didn’t lose my Dad as many do, later in adult life. I feel like I don’t know him much at all, because the last time I saw him was when I was around 5 or 6, on a very special trip to NYC. I remember he put me in the windowsill at the Empire State Bldg, I did not think that was fun lol. And he ate fish eyeballs out of a big ole fish at some Chinese type restaurant, and teased me about eating one myself. He was a free spirit of sorts, I think, he must have been to have wanted the adventure of Alaska, where he chose to make his home when I was young. He lived simply, in a cabin, working on the pipeline, and took pictures of polar bears n such in the white tundra. 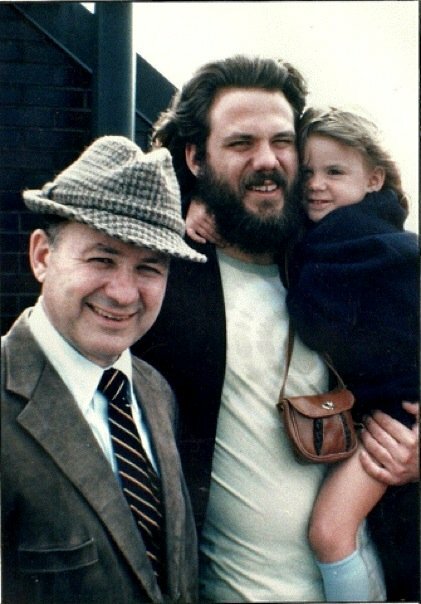 I knew somewhere in my little kid self that I would someday, when on my own, reconnect with him, after all he was my dad, and I had ideas about what it would be like to have had him in my life. But before that could happen, when I was 10, he was murdered by some crazy guy named Silka. Shivers. That guy murdered 8 others before he was stopped, killed by police after a manhunt on an Alaskan river outside of Fairbanks. They never found my dad, assuming he was in the river like so many of his victims. I think someday I need to go up there, get my head around it completely. Not just the sad part, but the parts that he loved about where he lived. Like the quote, I do talk to him way more than I ever thought I would, always during big moments. Like kids being born, I really lost it thinking about him finishing my first marathon, and Ironman. I have his nose:-) What else I have I’m not sure, but it’s kinda cool to think about pieces of me that could be because of him. Well I hope to have many more pretend conversations with Dad, it means I’ve had many more special moments. And certainly have a lot to look forward to catching up some day in person:-) Until then, I get to share Father’s Day with my husband, who embodies what I wish I’d experienced, and try to help my kids understand the absolute gift they have everyday! Happy Father’s Day to all the Dads! You are appreciated and loved more than you know.